lt;stronggt;SLOX8J8002lt;/stronggt;lt;BR/gt;Solo Symphony Design Trophy Foam Hot/Cold Drink Cupslt;BR/gt;These cups offer a single-cup solution for hot and cold beverages, a common lid fit for the 5 most popular cup sizes and a smaller case cube to minimize warehouse storage space. These efficient cups are durable and feature full print graphics to showcase operator brand identity. Trophy Plus offers improved cup rigidity and enhanced cup surface sheen. 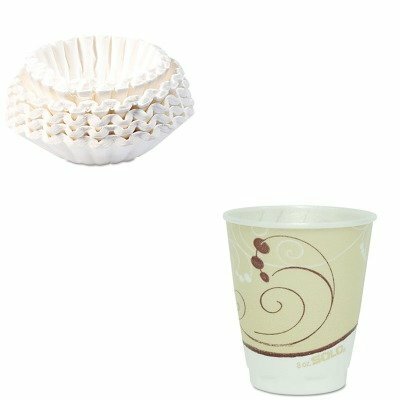 Cup Type: Hot/Cold Capacity Volume: 8 oz Materials: Foam Colors: Tan.lt;BR/gt;lt;BR/gt;lt;stronggt;BUN1M5002lt;/stronggt;lt;BR/gt;Solo Symphony Design Trophy Foam Hot/Cold Drink Cupslt;BR/gt;Fits 1.5-gallon coffee brewers. Stay-in-place design. Special paper assures optimum brew. Number of Cups: 12 Materials: Paper Shape: Flat Bottom.